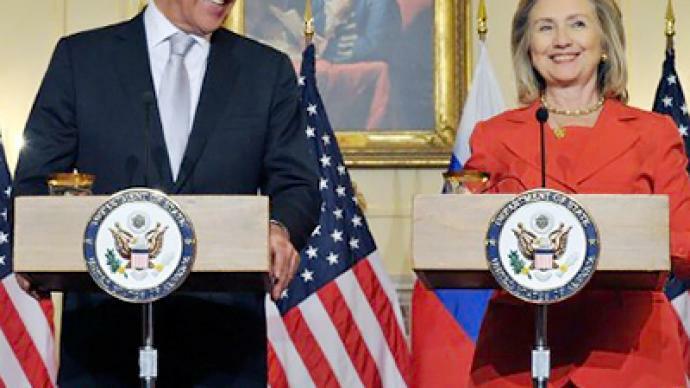 Following two days of talks in Washington, Russian Foreign Minister Sergey Lavrov and US Secretary of State Hillary Clinton detailed new developments in the bilateral relationship. Clinton opened the conference by reciting a long list of mutual accomplishments achieved by both Russia and the United States on various fronts. Clinton then mentioned the hot button issue of European missile defense, which has the potential of derailing the much-hyped reset between the two nations. Lavrov mentioned that President Barack Obama had confirmed the United States' readiness for talks with Russia on starting cooperation in missile defense. "President Obama unequivocally confirmed his agreement with President Medvedev on the importance of achieving understanding as soon as possible, which will create a framework for starting cooperation in this sphere," he said. Moscow has stated in the past that the construction of a missile defense system near its borders and without its full cooperation would be viewed as a national security threat, which could result in another arms race. On the subject of the New Start Treaty, the nuclear arms reduction treaty signed by President Dmitry Medvedev and Barack Obama in April 2010, Lavrov said that the control mechanism for this treaty is "effectively working." Lavrov said it is vital to “start the political process as soon as possible” to conclude the Libyan operation, adding that “we have different channels, official and unofficial channels to work through in order to create conditions for this process." NATO forces, which Russia has criticized in the past for “overstepping” its UN mandate in Libya, have been conducting aerial missions over Libya since March 19. 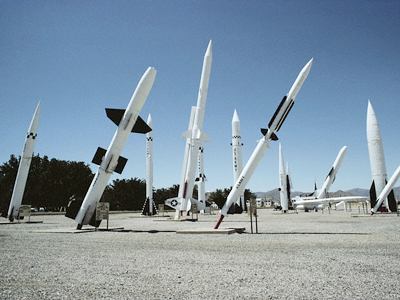 Many of these have led to the death of innocent civilians. Clinton said that the United States will continue to work with Russia and its international partners to achieve a cease-fire. "So, although neither of us can predictfor you the exact day or hour that Gaddafi will leave power, we do understand and agree that his days are numbered,” Clinton predicted. “We will continue to work closely with our international partners, including Russia, to increase the pressure on him and his regime and we will keep looking for a way to achieve a cease fire, end the military action." On the issue of Iran, its efforts to comply with the International Atomic Energy Agency's requirements should go together with easing pressure on Tehran, Lavrov advised. "We have proposed drawing up a kind of roadmap on each of the IAEA requirements which Iran must fulfill," Lavrov said. "We deem it possible, in response to each concrete, non-declarative step taken by Iran, to take a reciprocal step, freezing and cutting the volume of sanctions as progress continues," he said. Beyond the issues of security and arms control, Clinton said Washington supports Russia's accession to the World Trade Organization. “We strongly support Russia’s accession to the World Trade Organization,” she said. 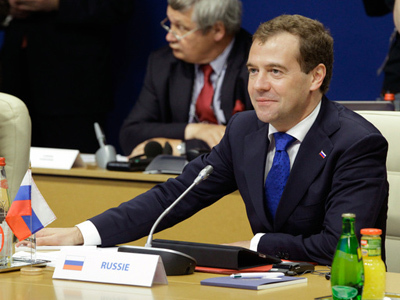 “Russia’s membership would allow us to increase trade and deepen our economic ties. The Russian Minister also noted that “there seemed to be the political will from the United States” to conclude the membership process, and now was the time to translate this into practical reality. Clinton and Lavrov signed an agreement on inter-country adoptions, which should go a long way to alleviating Russia’s concern over the wellbeing of its orphan children who are adopted by American parents. The agreement is a response to the furor sparked last year when an adoptive mother from the United States put an unaccompanied 7-year-old boy on a plane back to Moscow, saying she could no longer handle the stress of raising him. “This (adoption agreement) will help us remove the irritants that have been emerging quite rightfully in the realm of public opinion concerning the destiny of Russian children who were adopted by Americans,” Minister Lavrov added. Meanwhile, Russia and the United States also signed a new visa agreement, which will make travel between the two nations much easier for business people. Lavrov was upbeat about the new visa regime, while saying that it represents another step towards a visa free regime between the two countries. 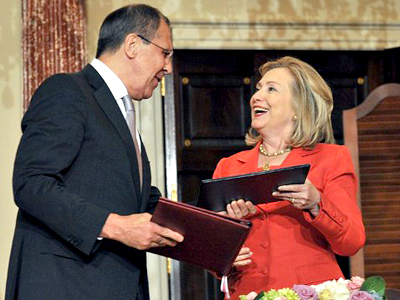 In other notable developments, Clinton and Lavrov exchanged diplomatic notes on the observance of domestic procedures required to enforce the Russian-American agreement on the disposal of plutonium (that is not to be used for defensive purposes), and the protocols to this agreement, signed in 2006 and 2010. The agreement obliges both sides to destroy no less than 34 tons of weapons-grade plutonium waste with the rigorous observance of the nonproliferation regime, according to the U.S. Department of State. Sixty-eight tons of plutonium is enough to produce about 17,000 pieces of nuclear weapons. The agreement envisions the disposal of a large amount of weapons-grade plutonium starting in 2018. The agreement marks one more step in the two countries' joint goal to eliminate weapons-grade nuclear materials, thereby reducing the nuclear threat, it said. 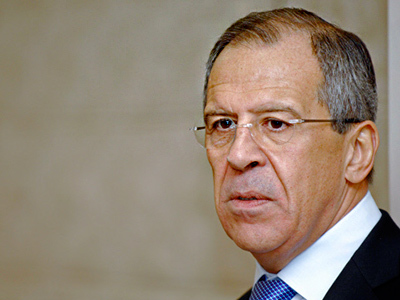 Finally, Lavrov also expressed his gratitude for the condolences offered by Clinton on behalf of the American people for the loss of life that occurred when a cruise ship sunk in the Volga River, which resulted in the deaths of over 100 people.